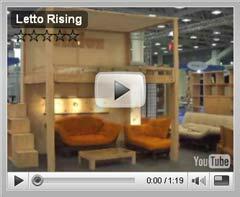 NIDO Loft bed Loft bed/ bunk bed designed for children's bedrooms. NIDO bed, a bunk bed in solid finger joint beech wood , can be made to measure. 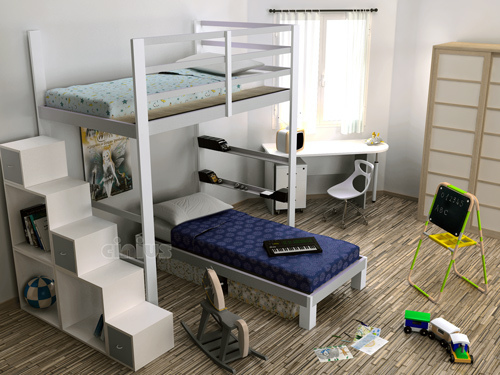 A loft/bunk bed designed for young children. In solid finger joint beech wood , can be made to measure, Nest is also an all-natural frame that enables you to increase the space available for playing and studying in kids' and teenagers' rooms. Tatami mats can be used as a mattress base, which a serves as a walkable floor area and a highly breathable mattress base and make it easy to change the bed sheets. 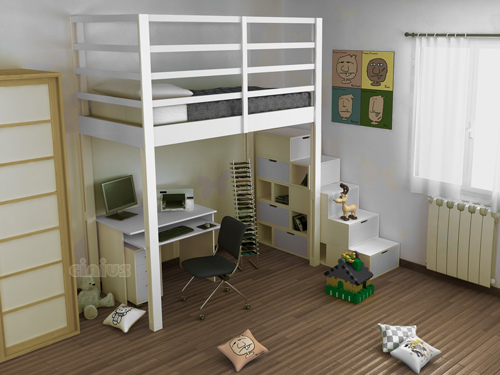 "Nido" can be combined with modular cube steps, which have the dual function of providing access to the platform and can be used as storage units/bookcase/drawers for the area below. The safety rail on two sides is 40 cm high (3 bars spaced 7cm apart) or 80cm high (4 bars spaced 14 cm apart). Height under platform 100/150/180 cm. In solid finger joint beech wood , fully interlocking frame, without metal parts (Magnetic Free).